According to the Environmental Protection Agency, pesticides have been linked to cancer, nerve damage, birth defects and other medical problems. Fortunately, there are many natural ways to control or eliminate common garden pests such as aphids, white flies and spider mites without resorting to dangerous pesticides. Three of the best methods of natural pest control are incorporating pest-repellent plants into your garden, encouraging pest-reducing insects such as ladybugs to visit your plants, and applying home-brewed non-toxic pesticides. Basil planted near tomatoes improves flavour and protects against a variety of pests. Borage repels pests that attack tomatoes and attracts pollinators to squash, tomatoes and strawberries. Chives planted near apples help to control apple scab. Chives planted near roses reduce the risk of “black spot” and repel aphids. Grind 3 large onions, 1 bunch of garlic and 3 hot peppers. Mix with water and leave overnight in a covered container. In the morning, strain through fine strainer or cheesecloth and add sufficient water to produce approximately one gallon (16 cups) of pesticide. Soak 10-15 diced garlic cloves in a pint (2 cups) of mineral oil for 24 hours. Strain and add to a spray bottle. Annie B. Bond, Care2 Green Living Executive Producer, offers a recipe for all-natural insecticidal soap spray, which uses 1-2 tablespoons of a natural liquid soap such as Dr. Bronner’s Pure-Castile soap in a quart (4 cups) of water. Once this solution is mixed, it can be added to a spray bottle. Another method of natural pest control is attracting ladybugs to your garden. 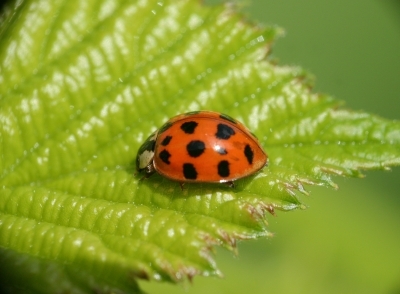 Ladybugs are voracious consumers of aphids and other garden pests. Plants that attract ladybugs include Angelica, Caraway, Cilantro, Coreopsis, Cosmos (particularly white), Dandelions, Dill, Fennel, Geraniums, Tansy and Yarrow. Ladybugs can also be purchased from certain garden supply stores. There are other insects that can aid in pest control, such as praying mantises and dragonflies. Spiders (which are arachnids rather than insects) are also highly beneficial. Art Knapp Information Library. (n.d.). “Plants That Repel Pests.” ArtKnapp.com. Bond, A.B. (30 May 1999). “Homemade Insecticidal Soap Spray.” Care2.com. City of Carlsbad, Public Works, Municipal Water Division. (2007). “Plants That Repel Pests.” Carlsbadca.gov. Environmental Protection Agency. (2007). “Pesticides and Food: Health Problems Pesticides May Cause.” EPA.gov. Ferragine, F. (n.d.) “12 Pest-Repelling Herbs.” CanadianLiving.com. North Carolina Division of Pollution Prevention and Environmental Assistance (DPPEA). (n.d.) “Home Brewed Pest Control.” P2pays.org.